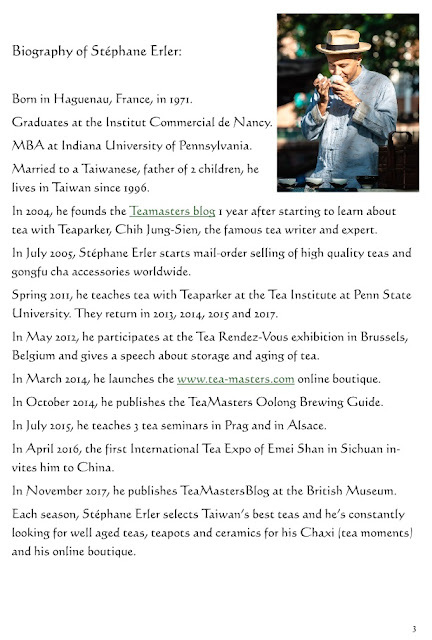 Tea Masters: The ultimate tea ware collection of Chinese emperors eBook is available! The ultimate tea ware collection of Chinese emperors eBook is available! I'm happy to announce that I have published my third eBook. 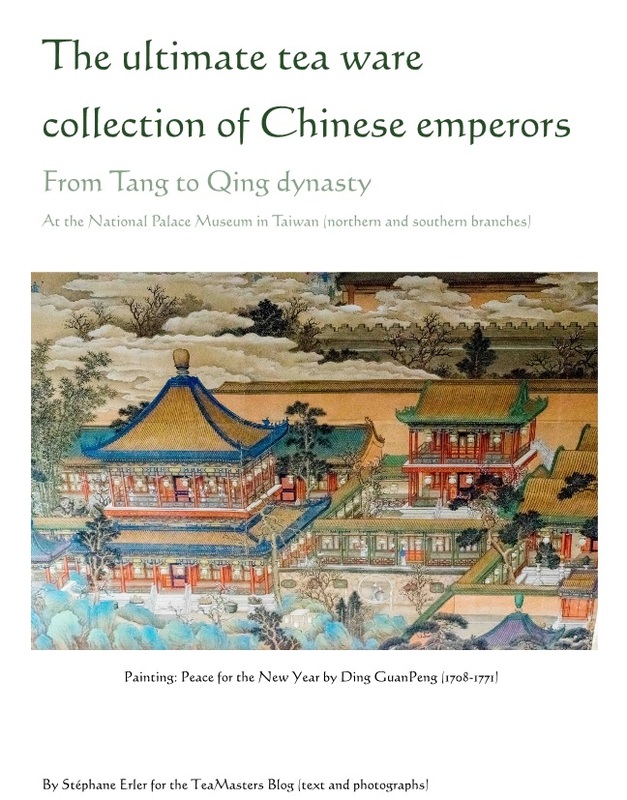 As you can tell from its cover above, it is about the tea ware collected by Chinese emperors and displayed in Taiwan at the National Palace Museum (in Taipei and Chiayi). This book follows a similar structure as my second eBook 'TeaMastersBlog at the British Musem'. 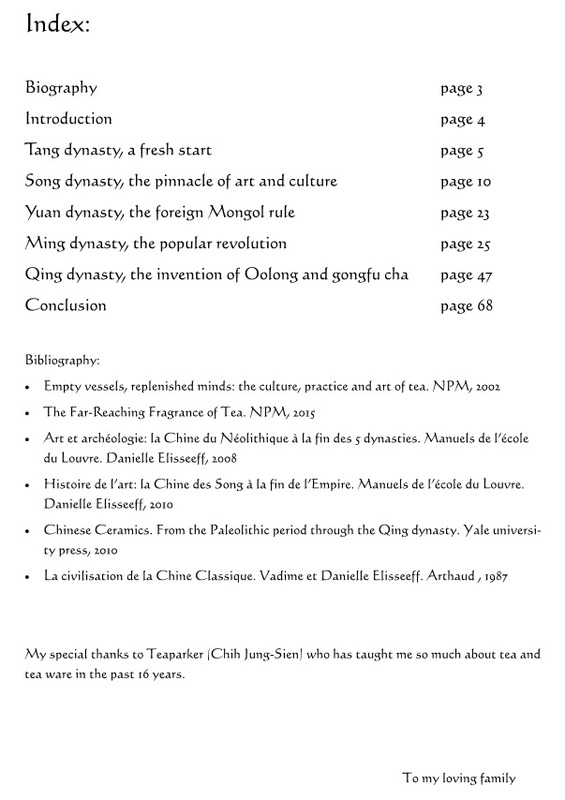 I tried to avoid repeating the same information by focusing more on the context of China's history in this new book. To read the entire eBook, go here. 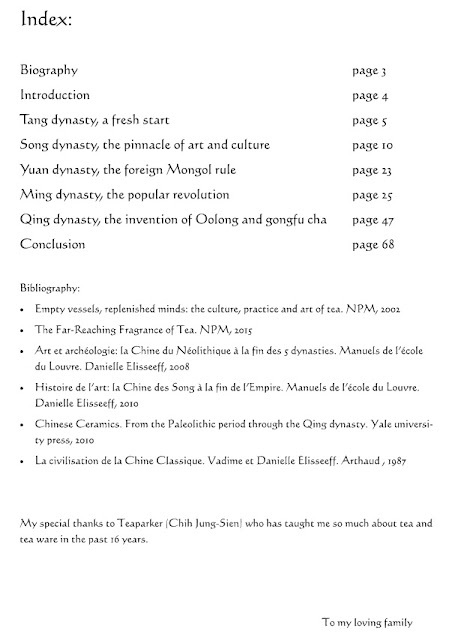 The price of this eBook is 8 USD. But it's FREE if you make a purchase of 200 USD (or more) on tea-masters.com ! And, if you make such a 200 USD purchase and have not received my other 2 eBooks, I will also add them FREE of charge! 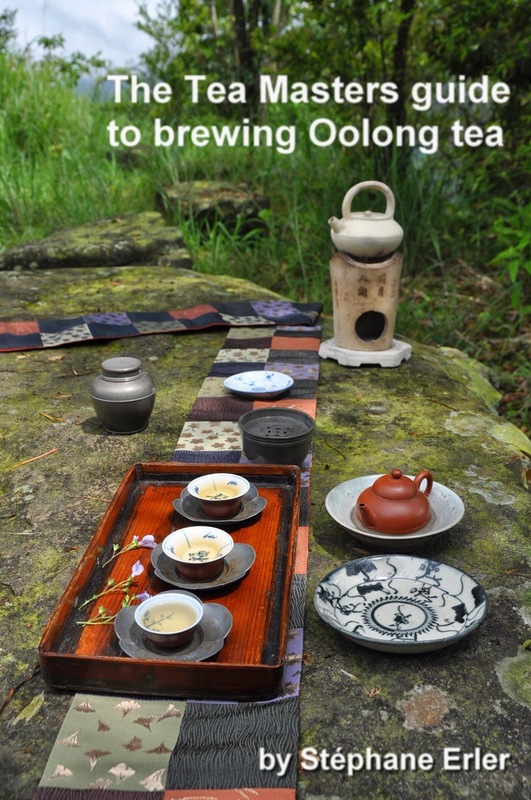 So you'd get 3 free eBooks about Oolong brewing and imperial tea ware with your purchase! 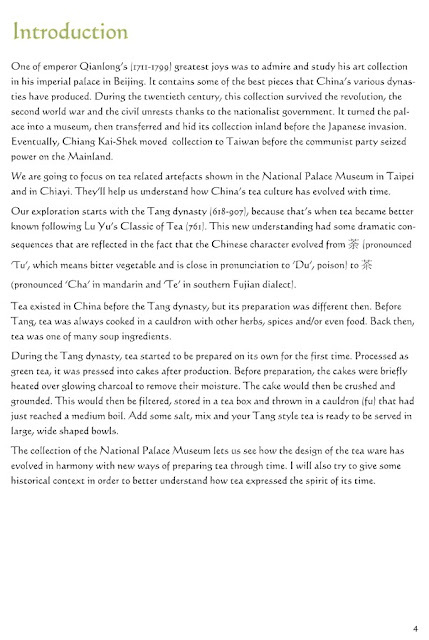 But why is this imperial tea ware collection so important? How can this knowledge add to today's tea brewer's experience? These tea ceramics at the National Palace Museum (NPM) have a clear origin and meet the highest standards, because they once were made or selected for the emperors of China. In the world tea ware fakes, imitations and replicas are plenty! 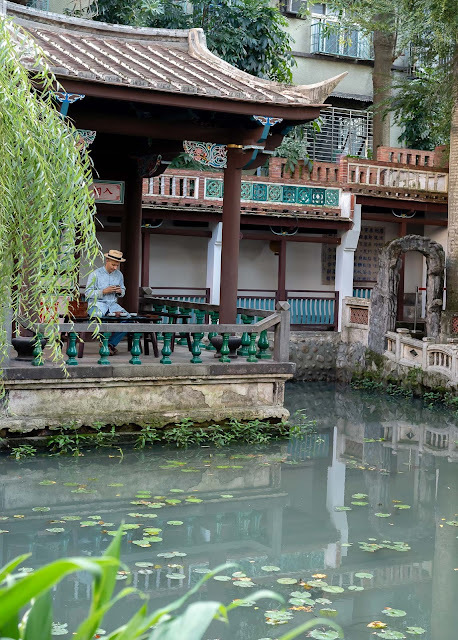 Museums are the best places to see genuine antiques, and the reputation of the NPM for Chinese art is second to none. 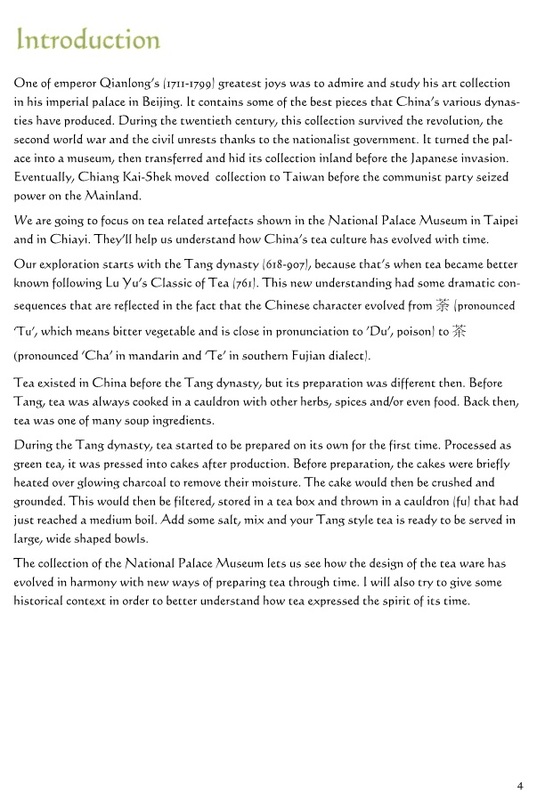 Besides, this collection includes tea ware that is over 1000 years old. Tea was prepared very differently then. 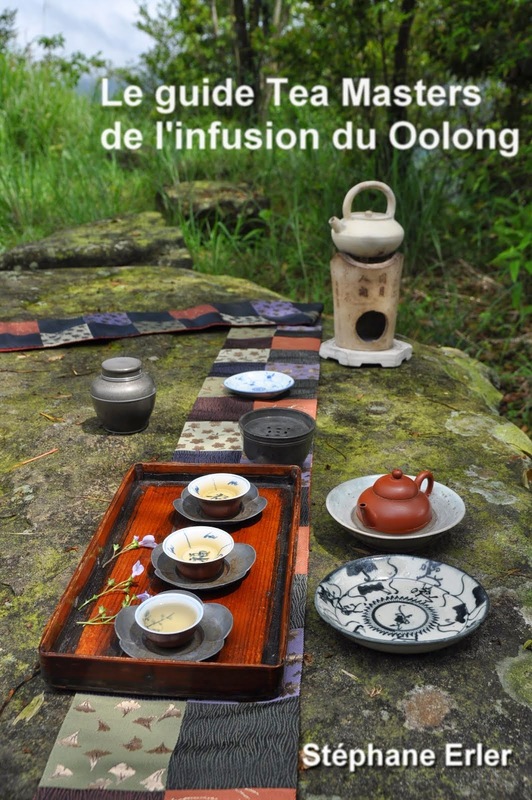 This is an opportunity to learn how the wares fit the way tea was enjoyed. The meaning of the saying "Those who don't know history are doomed to repeat it" is that those who don't know tea history are destined to make lots of mistakes. 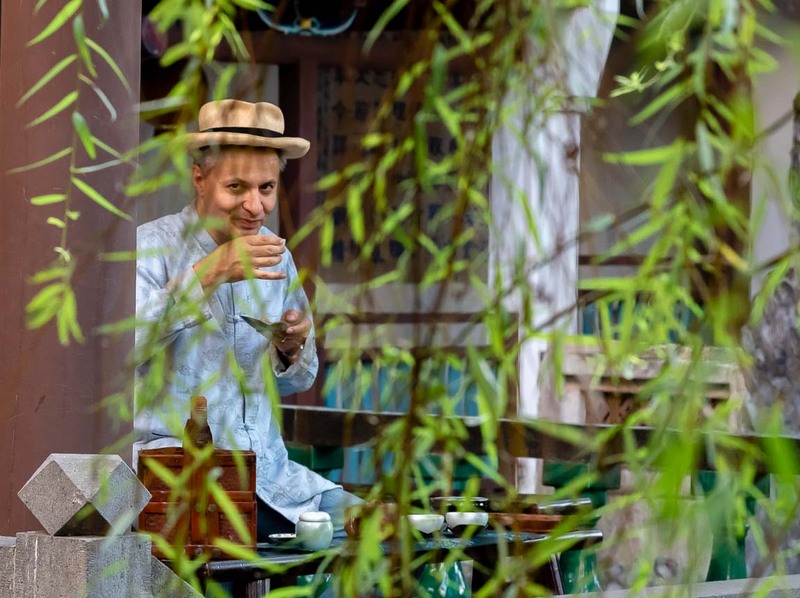 However, one way to learn from history is to try to repeat, to imitate the way tea was (correctly) brewed in the past! 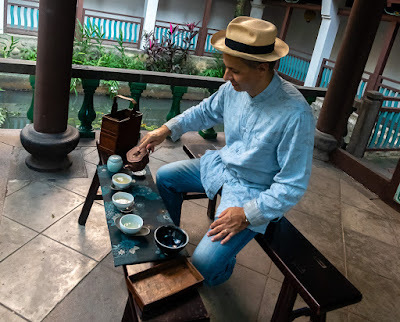 In these pictures, for instance, I'm brewing my sheng puerh in Ming dynasty style: I'm using a large Yixing teapot and large celadon cups (or small bowls). This method is a good fit for green tea or for lightly brewed sheng puerh. 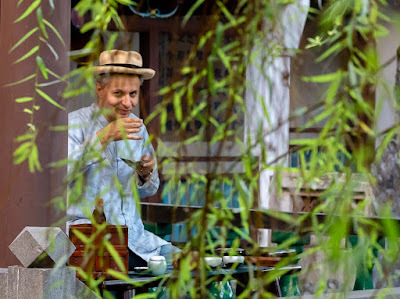 That's the way countless Ming dynasty literati, officials and court members were enjoying their tea 500 years ago. It's good and necessary to know the tradition before you want to change and improve it! 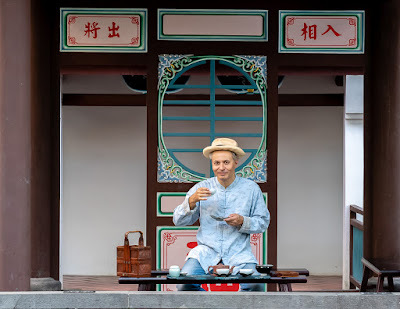 See how much fun it is to mix the old and the new in my tea ware and in my clothes, to follow some traditions and break others (my hot water came from an automatic water dispenser, for instance), to brew Ming style in a Qing dynasty garden...! 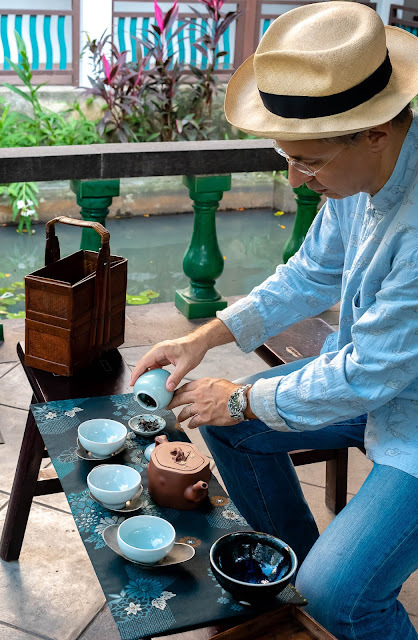 This eBook isn't about finding antique tea ware, it's about finding knowledge and beauty, and turning it into inspiration! "...it's about finding knowledge and beauty, and turning it into inspiration!" A very exciting idea, to think that we are never alone, nor starting from scratch; we can borrow from the past and add something in the present. Exactly as happens for a visual artist, through appreciating beautiful works from other times.... one learns and absorbs until, finally, something may be transformed into inspiration, often unexpectedly! Thank you for this new book (I'm about to order it) I know I'll find inspiration there as well! Mon nouveau livre numérique est arrivé!